Bhedaghat is a town in Jabalpur district in the state of Madhya Pradesh. It is situated by the side of river Narmada and is approximately 20 km from Jabalpur city. Its most famous sights are the Dhuandhar Falls, Marble Rocks, and the Chaunsath Yogini temple. Its major attraction is a waterfall known as Dhuandhar, which looks like smoke coming out of the river and therefore it got its name as "Dhuan(smoke) - dhar(flow of water)". 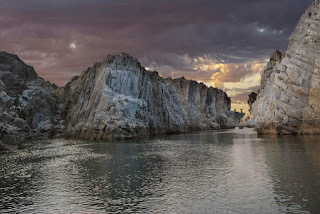 In a moonlit night, the travel between the marble rock mountains in a boat on the river Narmada is a heavenly site which should not be missed for anything. Different colors are seen of Marble rocks such as blue, white and pink.The tranquil beauty of the view is great. One can even enjoy the view of sunlight sparkling on the marble-white pinnacles. Another majestic view to enjoy is black and green volcanic seams other than white rocks.